I wanted to make the gift box be the focus of the card, so I cut it out in a bright white, and adhered a strip of red cardstock to it before attaching the black tag with a red ribbon. 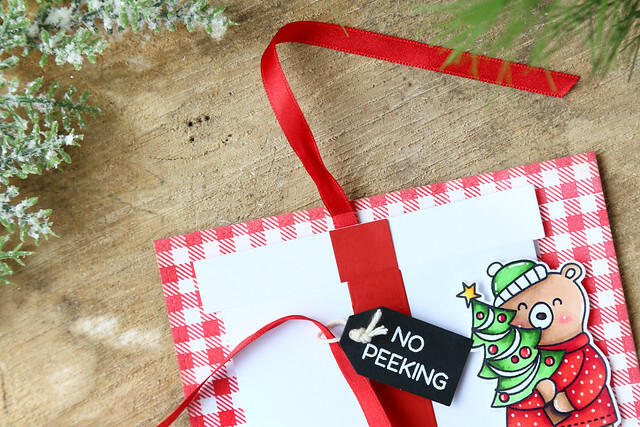 The "no peeking" sentiment is from Avery Elle's Snow Tags set. On either side of the gift box, I stamped some adorable images from A Merry Little Christmas. The little mouse in his Xmas pjs is so cute! I colored them using copic markers, throwing in as much red and green as possible. 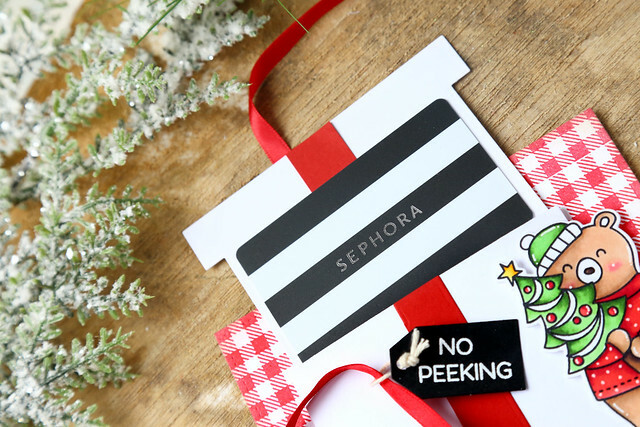 There is a fun little present inside! I stuck the gift card down using temporary adhesive, so it could easily be pulled off. I love that the inside of the card is completely free for a nice, long message! Oh sweetie, you did a fabulous job for Lawn Fawn today. Did you not want to create your own blog post with all your pretty party decorations? There is lots of love waiting for you over there in the comment section! I just wanted to say that that was very, very clever of you to think of using all those stamps that you pulled from the different sets to create a Cinderella Halloween party theme!